7 Search Results for "#Project Stakeholder Management"
Boss: I just had a long drawn call with client and I have committed on team's behalf that we can complete the new project in two months. We can do it, right? At the project Kick-off Meeting. Dev: Team, I have called this meeting to not just discuss about the new project but I also want you to make a list of excuses for sure-shot ULTIMATE DEBACLE of our new project. 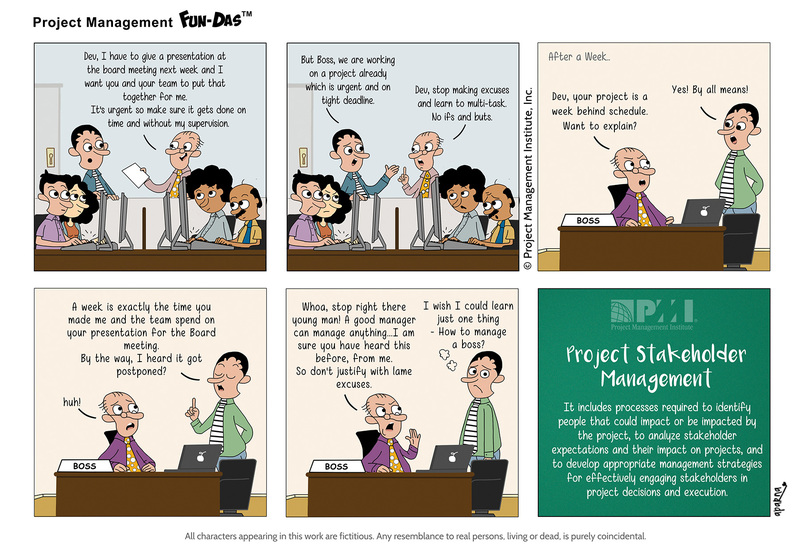 One of the most difficult aspects of project management is setting and then managing expectations of both stakeholders and clients. While creating a timeline and defining the scope of a project upfront is beneficial, if the expectations are impractical, the schedule and budget can easily go off the track. Boss: Dev, I have to give a presentation at the board meeting next week and I want you and your team to put that together for me. It’s urgent so make sure it gets done on time and without my supervision. Dev: But Boss, we are working on a project already which is urgent and on tight deadline. Boss: Dev, stop making excuses and learn to multi-task. No ifs and buts. Boss: Dev, your project is a week behind schedule. Want to explain? Dev: Yes! By all means! Dev: A week is exactly the time you made me and the team spend on your presentation for the Board meeting. By the way, I heard it got postponed? Boss: Whoa, stop right there young man! 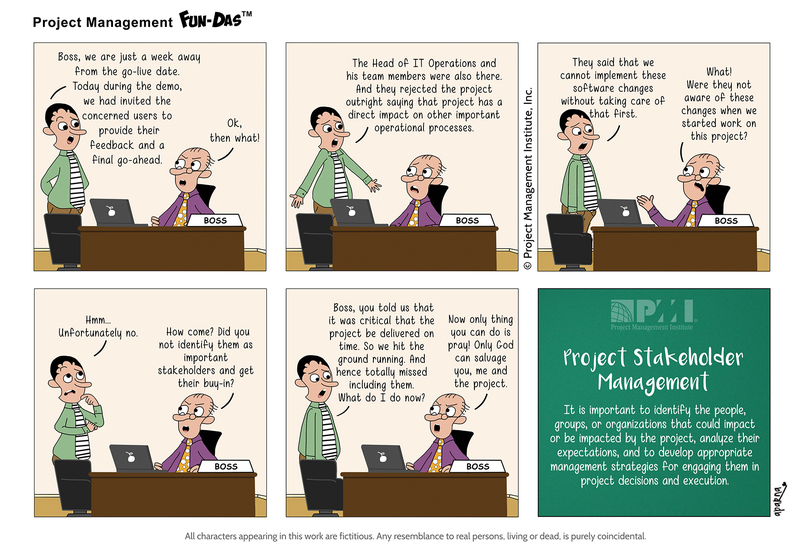 A good manager can manage anything…I am sure you have heard this before, from me. So don’t justify with lame excuses. Dev (thinking): I wish I could learn just one thing - How to manage a boss? It includes processes required to identify people that could impact or be impacted by the project, to analyze stakeholder expectations and their impact on projects, and to develop appropriate management strategies for effectively engaging stakeholders in project decisions and execution. Project Manager: Boss, we are just a week away from the go-live date. Today during the demo, we had invited the concerned users to provide their feedback and a final go-ahead. Project Manager: The Head of IT Operations and his team members were also there. And they rejected the project outright saying that project has a direct impact on other important operational processes. Project Manager: They said that we cannot implement these software changes without taking care of that first. Boss: What! Were they not aware of these changes when we started work on this project? Boss: How come? Did you not identify them as important stakeholders and get their buy-in? Project Manager: Boss, you told us that it was critical that the project be delivered on time. So we hit the ground running. And hence totally missed including them. What do I do now? Boss: Now only thing you can do is pray! Only God can salvage you, me and the project. It is important to identify the people, groups, or organizations that could impact or be impacted by the project, analyze their expectations, and to develop appropriate management strategies for engaging them in project decisions and executions. Project Manager: For our project Kick-off meeting next week, here is the list of potential stakeholders who need to be there for the meeting. Their valuable insights will help us a lot in making the scope document. Project Sponsor: Hmm... I think we should ignore #1 and #4 because I strongly feel that these two are not going to make any significant impact on the project, per se. Project Manager: (thinking) My entire effort of carefully identifying key stakeholders will now go down the drain, thanks to his personal preferences. Project Stakeholder Management The ability of the project manager to correctly identify and manage the stakeholders in an appropriate manner can mean the difference between success and failure. Project Manager: We have a Requirements Gathering meeting with the client in some time. Be ready! Team: Yes Sir!! Project Manager: Why is this here?!!? Team: This client keeps changing the requirements at the drop of a hat. So we have planned to freeze them once finalized. Stakeholder Management The requirements document once finalized needs to be agreed and approved by all stakeholders before the project starts. Client Side Hi! You've reached Dev's number..but I am busy in STRESS MANAGEMENT TRAINING! So leave a message and I'll get back when FREE! Vendor Side Project Manager: Sir, your review comments on the project development have been long overdue. We can't start with the next sprint tasks till then?¢?‚¬?¦ PLEASE CALL BACK! Stakeholder Management Contingency planning needs to be defined when creating risk register along with mitigation plan. Boss: Team, here is the new application we have to work on and these are the features. A month later... Boss: Team, the client is happy with our work so far but... he has suggested just a few features to be added. Employee 1: (Thinking) There goes my vacation, out of the window! Employee 2: (Thinking) "A FEW" features!?! Stakeholder Management Establish effective change control supported by review and approved by relevant stakeholders before implementation.